What abbreviation stands for Payment when dealing with document types? I'm aware CRM stands for Credit Memo, but what would it be for a Payment? Also, is there anywhere I can look to find all of these abbreviations? I don't know of a way (yet) to look up the master list, but if you have transactions, then you can see the codes that get stored in the database for each transaction. 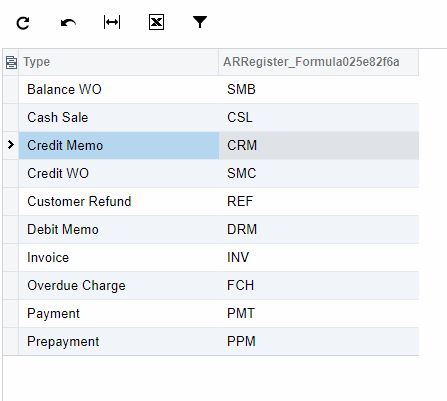 The second column above is referencing the same field as the first column (ARRegister.DocType), but wrapping it in the CStr formula which converts it into a string, exposing the raw value. And here are the results. You can see that "PMT" is the value you are looking for.